Sgt. 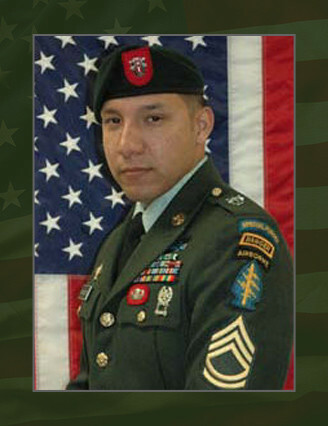 1st Class Victor H. Cervantes, 27, was a Special Forces weapons sergeant assigned to 1st Battalion, 7th Special Forces Group (Airborne), at Fort Bragg N.C. He was killed in action while supporting Operation Enduring Freedom on June 10, 2005 in the vicinity of Orgun-e, Afghanistan serving as a member of the Quick Reaction Force responding to enemy contact reports from another patrol. A native of Stockton, Calif., Cervantes was born Nov. 13, 1977. He enlisted in the Army as a cavalry scout July 24, 1996 under the delayed entry program. He arrived at Fort Bragg to the 1st Special Warfare Training Group (Airborne) in September 1999 to begin the intense training it would take for him to become a Special Forces weapons sergeant. Cervantes was assigned to 7th SFG in August 2000. His military education includes the Basic Airborne Course, the Primary Leadership Development Course, the Basic Noncommissioned Officer Course, the Ranger Course, the Special Forces Assessment and Selection Course, the Special Forces Qualification Course, the Spanish Language Course and the Survival, Evasion, Resistance and Escape Course. Cervantes’ awards and decorations include the Joint Service Commendation Medal, the Army Commendation Medal, the Joint Service Achievement Medal, the Army Achievement Medal, the Good Conduct Medal, the National Defense Service Medal, the Armed Forces Expeditionary Medal, the NCO Professional Development Ribbon, the Army Service Ribbon, the Global War on Terrorism Expeditionary Medal, the Global War on Terrorism Service Medal, the Combat Infantryman Badge, the Parachutist Badge, the Ranger Tab and the Special Forces Tab. He was posthumously awarded the Bronze Star Medal for Valor, the Purple Heart, the Meritorious Service Medal and the Afghanistan Campaign Medal. His parents, Fidel and Nisla of Stockton, Calif., and sister, Elizabeth of California survive him.